Something to think about, is Social Media a new addiction? Are you a social media addict? 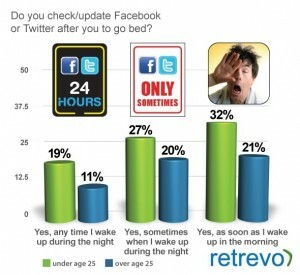 According to research from Retrovo almost half of the respondents said they check in on the social media scene in bed, during the night or as soon as they wake up in the morning. Between 15% and 23% of of social media users saying this is how they get their morning “news”. What about the fact that 56% of social media users need to check FaceBook at least once a day? According to this study it appears that social media may have begun to replace more conventional sources for news with many social media users. But you already knew that, didn’t you? Need help? There is always the Social Media Addicts Association. Have a look behind the scenes filming at a Social Media Addicts Association meeting, with members discussing the problems caused by their addiction in graphic detail. Be warned – this is harrowing viewing, not for the faint hearted!